The clues are in, the chase is on, and the case of the century is about to break wide open in Disney's greatest little mystery in history! Let the creators of Aladdin and The Little Mermaid take you on an adventuresome journey through the cobblestone streets of 1897 London, where some suspicious "mousechief" is the suspenseful start to this thrilling musical adventure. Olivia, the brave daughter of a beloved London toymaker, turns to Basil of Baker Street for help with her father's disappearance. Basil's jolly assistant Dr. Dawson and loyal dog Toby lend a hand... and nose... as they sniff out clues through their charming miniature world. The final chase leads to Professor Ratigan (voiced by Vincent Price), a hard-hearted criminal whom Basil must outwit to save all of Mousedom! Now digitally remastered, fully restored and full of unforgettable characters and spectacular animation - all leading to a climatic climb atop Big Ben - it's elementary who you'll want to watch again and again... 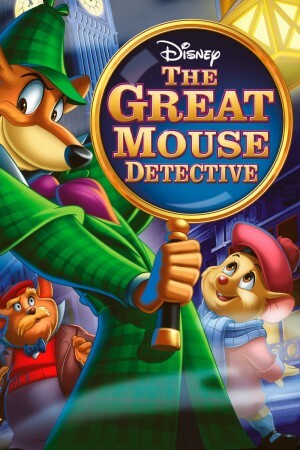 The Great Mouse Detective!